The MESA 7I61 is a low cost, general purpose programmable I/O card that connects to the host computer via USB. 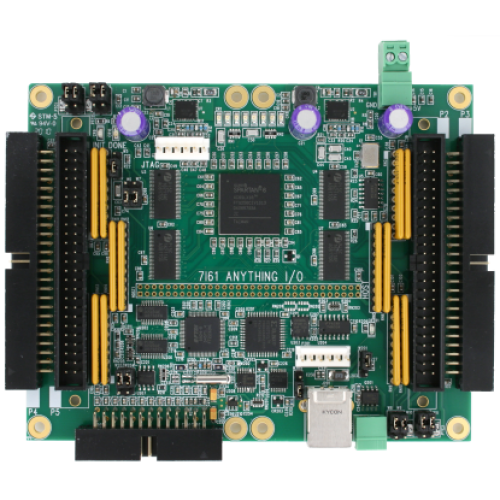 The 7I61 uses a XC6SLX16 or XC6SLX25 Xilinx FPGA for all logic, so it is truly an Anything I/O card. 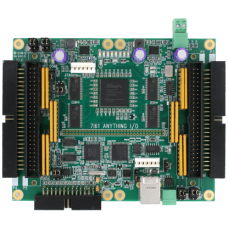 The FPGA is downloadable from the USB, and also has the capability of local configuration storage in an on card EEPROM. Efficient switching regulators are used for FPGA core and 3.3V power, allowing the 7I61 to be USB bus powered. The 7I61 can also be powered by an external 5V source. A FTDI FT2232H high speed USB interface chip is used for the USB interface allowing transfer rates up to 25 MBytes per second. Drivers are available for Windows and Linux. The drivers avaliable for the FT2232H make the software interface a simple buffered byte stream. A 50 MHz oscillator provides the FPGA clock. This clock can be multiplied or divided in the FPGA for other clock rates. The 7I61 has 96 I/O bits available on four 50 pin connectors. Both connectors use I/O module rack compatible pinouts. All I/O bits are 5V tolerant, LVDS signaling is supported on all an I/O pairs. The I/O connectors are compatible with our 7 series daughter cards for isolated I/O, motion control and other applications. Configurations are provided for simple GPIO, Smart Motion control (SoftDMC), host based motion control (HostMot2), and a waveform generator.